Comprising a series of self-portraits, Safari Fantasy marks a recent development in Samson’s practice that in earlier work has centred on the depiction of fictional white male figures and Vanitas-like still lives. In these new paintings, we find the artist himself, casually dressed, in slightly fantastical or dreamlike natural settings, each time differently posed but always according to the same traditional composition. In many of the works, the artist’s face remains incomplete. Recalling the smooth marble of classical sculpture, empty white eyes stare out at the viewer – as if they were in fact looking inward – suggesting the preeminence of the interior life of the artist-subject over the external world. The backgrounds are partly real and partly imagined, composites of his own fantasies and the scenic landscapes of Cape Town and rural Eastern Cape, where this body of work was produced. For Samson, this body of work is pivotal. 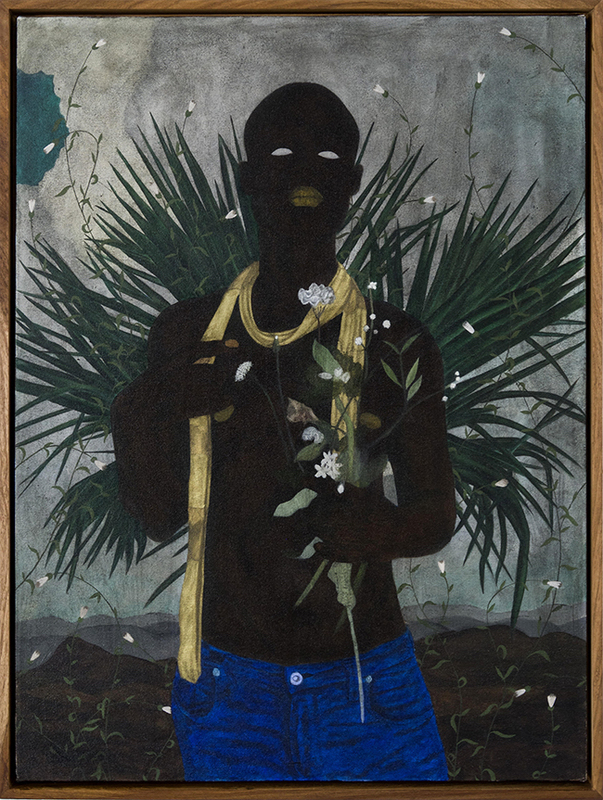 While previously he has engaged with themes of masculinity and race, and the frustrations of young black Africans and their sense of displacement within the nationalistic narrative of social cohesion, his intention with these paintings is to move away from the socio-political context of their making and instead shift his gaze inward.